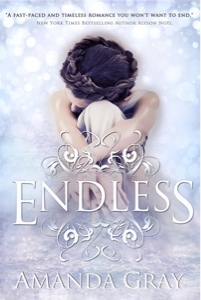 I received an advanced reading copy of Endless in exchange for an honest review. I was really excited about this book going in mainly because the cover is so ridiculously beautiful. Silly, I know, but I just can't help it sometimes. Anyway the words inside of the pretty cover did not disappoint. This story was engrossing, beautifully written, and wholly unique. This is the story of Jenny. Jenny is a loner who would rather spend her time making art than hanging around people because every time she touches someone she gets a rush of history from them. A lot of times the history is painful and unpleasant. Things start getting crazy when she meets the new boy, Ben. They soon realize that they have lived a past life together in Russia. In this past life she also sees a mysterious green-eyed boy named Nikolai who she has been dreaming about. Things get REALLY crazy when Nikolai shows up in her life. It turns out Nikolai has actually traveled through time from their past life. Unfortunately his arrival brings with it problems and consequences. First off I just need to reiterate how unique this story is. I honestly can think of nothing to compare it to. I've read stories about time travel, but never one that combines both time travel and reincarnation. I love that Jenny has such a unique ability. It's so refreshing to read about a world and characters that are so unlike anything I've read before. It's easy, when you read A LOT, to start to feel like there are no more original stories out there. This book definitely broke the mold. The characters were also very well crafted. I cared about Ben and Nikolai, but especially Jenny. I rooted for Jenny the entire book. I love that even with all the crazy stuff going on and her strange ability she still has relatable problems and feelings. It was easy for me to connect with her on a human level, which can sometimes be lacking in fantasy novels. This story was so well written. It was well-paced with strong development of the characters throughout the story. The words themselves were obviously carefully chosen and had a wonderful flow to them. The story never lulled at all and the mysteries kept growing so that it is impossible to get bored or stop reading. Gray even managed to weave some interesting history into the story. I always appreciate learning a little something when i read a fantasy novel. It was also highly unpredictable, which always impresses me because I have become irritatingly good at predicting the outcomes of stories. This story ends in such a way that it could easily be continued on in either a sequel or a series. I'm really hoping it does continue on. I for one would really like to find out what happens next for Jenny. But whether she continues the story or not I look forward to reading whatever Gray writes next. She has a brilliant way with words and obviously has some incredibly unique ideas. I definitely consider myself a fan for life. Click here to view more stops on the tour including guest posts, reviews, interviews, and spotlights. It sounds like a beautiful story. Thanks for having the giveaway.